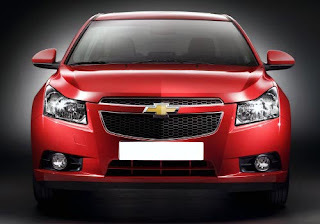 General Motors launched its much awaited luxury sedan Chevrolet Cruze in India on 12th October. The car's 2.0 litre petrol engine variant is launched initially. The 1.8 litre petrol engine variant will be launched in the months to come. The prices of the car starts from Rs 10.99 lakh. The high end variant is priced at Rs 12.45 lakh (ex-showroom, Delhi). The Chevrolet Cruze is pitted against Skoda Octavia, Honda Civic and Toyota Corolla. As per the Automotive Research Association of India (ARAI) standards, the car would give a fine fuel economy of 18.3 kmpl. The company also informed that a mini car would be introduced by the end of the current year. The yet-to-launch small car is christened as Beat and developed on the same platform. This mini car would be having a price tag of Rs 4 lakh. Apart from this, General Motors small car Chevrolet Spark with a 800cc petrol mill would be launched in 2010. According to news reports, over 1100 units of the sedan already booked across the nation. GM India had also said that it would go ahead with the launch of its long-expected mini car, named and developed on 'Chevrolet Beat' platform by end of this year. The car is expected to be priced around Rs 4 lakh. Besides, GM India has also geared up to introduce its small car Chevrolet Spark with a 800cc petrol engine in 2010. Now Chevrolet Cruze has Jet Black Interiors with Titanium Stiching which enhances its beauty.